EXPLORE THE 2nd GRADE CURRICULUM. With Wood Acres outstanding phonics and early literacy curriculum under their belts, Second Graders begin to “read to learn” rather than “learn to read”. 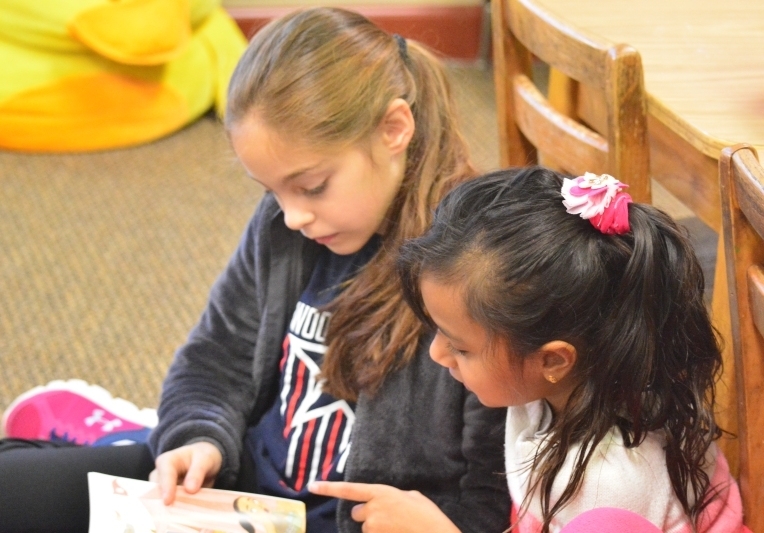 Comprehension and proficiency are integral parts of the Second Grade reading program supported by book reports and encouragement of independent reading along with the introduction of more challenging text. Students develop a growing understanding of the mechanics of writing including the structure of sentences and paragraphs as well as creating topic sentences and summary sentences. Vocabulary words tied to the curriculum are introduced weekly with ample opportunity to practice and learn the spelling of these words as well as how to put them into proper context. With all the great writing work, students also focus on proper punctuation so that, as they continue on in their academic careers, they have the mechanics down and can focus on writing creatively. Students have mastered their print penmanship by the end of First Grade and will begin cursive instruction by mid-year of Second Grade. Penmanship work is a great help in the continuing development of small muscle coordination and eye-hand coordination. Utilizing a nationally recognized rigorous curriculum, Wood Acres believes that math must connect to the student’s world if it is to make sense. Weaving math into their lives and setting the problems in an engaging, real-life context teaches math the way children learn best. Timed tests for both addition and subtraction facts continue in Second Grade to foster student accuracy and speed as 2 and 3 digit addition and subtraction is introduced. Students begin to learn regrouping early in the year and will begin their early multiplication and division work by the second half of the year. Building on early skills learned in First Grade, the students will revisit money and time as well as place value to 1000. Measurement, geometry, fractions, pre- algebra, and probability as well as problem solving are also introduced to our budding mathematicians in Second Grade. The science curriculum in Second Grade investigates numerous areas of exploration and fact finding. The study of weight and volume, the Earth’s surface, water cycle and sound will be complemented by experiments in a lab designed for our young scientists called the Beaker Jr. While working in this space, science will leap from the page into hands-on experiments and the hands of our talented Second Grade scientists as they don lab coats and embrace the scientific process. Written conclusions and summarizing reporting of their findings links the writing process to the scientific one. The connection of science and mathematics is also emphasized and explored in experiments and discussion of data collection and data analysis. Students learn about the world around them while utilizing a Core Knowledge and geography curriculum. Content is linked with age appropriate literature, cross-curricular activities, multi-cultural awareness, and critical thinking skill development. Students are introduced to ancient cultures including China, India, Greece, Egypt and Japan as well as studying the push toward the American West. Civil rights discussions are introduced as well as the study of the Constitution and citizenship. Geographic skills such as working with maps and globes help students know where they are in time and place. Building on the skills learned in First Grade, students in Second Grade continue to work on typing speed and accuracy with keyboard practice during each Computer Lab. Age appropriate instruction is also provided in our secure laboratory setting with educational software programs and an introduction to application skills including dragging and dropping, changing font sizes and colors, formatting basic paragraphs and responsible use of the Internet. Faculty collaboration with the Lab teacher links classroom learning to the Internet and other activities for second graders in the computer lab. Students also travel to the HIVE, the STEM lab. Blending traditional music instruction with high student interest materials, the Wood Acres music program helps create students who become an educated audience as well as engaged performers. Program goals focus on comfortable and accurate singing as well as expressive sensitivity when listening and/or responding to music. Students read music, sing, and learn about the culture surrounding the music they study. Students develop physical skills and sportsmanship in PE that allow them to participate and derive enjoyment from sustained physical activity. Teamwork, fair play, and doing one’s best are always emphasized as exercise and as a healthy life habit to acquire. Wood Acres students are fit and participate in the wide array of after school sports offered in our community. As part of a strong academic focus at The Wood Acres School, Spanish classes for Second Graders meet three times a week. Students build on their early language skills, expanding their vocabularies and conversational skills. To aid in comprehension, the students are taught in Spanish to immerse them in this rich language. The Spanish program builds fluency and confidence beginning in Wood Acres Early School program and continuing all the way to high school ISA and Spanish honors classes for our graduates!